Is Microsoft Grasping at Straws? Two articles caught my attention this week and both of them came from The Verge. Both stories came out within 2 days of each other. In that they both dealt with Microsoft talking about or actually reversing previous decisions about Windows 8, I had to wonder if this was Microsoft damage control at work. It would seem so. Early sales figures were far more than disappointing for the folks at Redmond. So disappointing in fact, that the company made public at least some intentions of making amends to their customers. The first pooey to hit the blades was the initial layout of the Windows 8 desktop. It’s not that people were complaining about the initial “getting used to it” period; it was more like a “get this out of my face” period. It appears that the lack of a start button just plain flat pissed people off. And who in hell decided to use Aunt Tilly’s old quilt pattern on the Desktop? The new interface disrupted users workflow, caused mini revolts at the workplace and made doing and finding things a challenge, to say the least. Even longtime Windows user and stalwart Adrian Kingsley-Hughes hates it. When your most avid fans turn on you…ya gotta take notice. So Microsoft is strongly considering putting the start button back where it belongs. How many focus groups did they have to use to figure that brain-child out? Well, I for one am glad to see this happening, although a few friends who do Windows repairs and reinstalls aren’t particularly happy with it. They got a $75.00 service charge for arriving just to change the desktop layout. Microsoft intention to return the start button and its traditional function will surely produce a wailing and gnashing of teeth in the Windows service shop circles. It’s been my experience that Redmond is loath to give away anything. But since the Android phone and tablet rampage, Microsoft is desperately looking for ways to catch up in the mobile sector. So what do they intend on doing? Well, they decided it might be a good idea to give away Windows Phone and Windows RT systems for free. They see this as a sure-fire way to combat Google’s hold on the mobile market. There’s mention of that pesky start button again. Microsoft has to do something to at least make a showing in the phone and tablet market. How better to do that than to imitate your leading competitor? I dunno. Sounds like a good plan to me, but Microsoft’s plans haven’t always worked out in their favor. Hey fellas, how’d that acquisition of aQuantive work out for ya? I guess when you are sitting on the Mount Everest of cash piles, six billion dollars isn’t that bad…right? So, right now Microsoft is counting on giving their customers what they should have gotten in the first place and copying their competition to stem the green bleeding. I wish them luck, if only for the large amounts of friends I have working there. But as in long races, when one horse falls far behind, the best you can do is cut the legs from everyone in front of you. Oh wait, there’s always Rockstar. Never mind, seems they got that covered too. 10 comments to Is Microsoft Grasping at Straws? Once any version of Windows is given away at $0 MS has set precedent that will be hard to ignore. They risk users wanting any version for $0. My understanding with Android and ChromeOS the reason device manufacturers like them is they are free, backed by someone other than MS, and the code is available. The last point is what is probably more critical; the manufacturers can modify or adapt the code to fit their needs. There is nothing free about M$ but if it makes its products available gratis it’s really dying and it knows it. Taking the start menu away without it being an option is probably the dumbest thing they have done. They even included Program Manager with XP to allow users to fall back if they wanted (though it was really not usable). 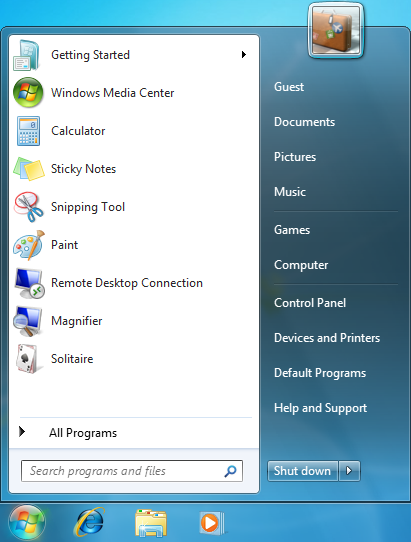 To completely remove the start menu replacing it with a new interface that’s clunky and hard to use is just terrible. Fortunately a lot of products like Classic Shell are out there to put it back. Hopefully it’s a lesson learned for the next version of Windows. @Hans, it’s not a sign of dying at all, it’s a sign of being competitive. Microsoft doesn’t need to sell Windows to be successful since they have so many bolt-ons and are moving to the store structure like what you see with Google and Apple. I personally use Linux. I work as a PC service/support tech. Over the years I have seen various versions of Windows come and go. While I do my best to move people off of Windows and on to Linux whenever I can I take an approach of whatever the customer wants. I measure the success of the versions of Windows by the build requests for systems using those versions. WindowsXP still remains the most popular version and in fact people would still have me build WinXP systems if I could get a steady supply of install discs for it. No one wanted Vista and even less want Windows8. Windows8 is universally despised and the best I hear said about it goes something like “Well…..you get used to it……after a while”. That is said with the same tone one would use when talking about a “root canal”. You ‘get used to it”. As for myself, while I could tolerate working with WinXP and other versions….even Vista….I cannot stand working with Windows8. At first I dealt with the convoluted klusterfudge that is the Metro interface. Now, if I am unfortunate enough to have to work on Windows8, I just install “Classic Shell” and avoid all the frustration of dealing with “Metro”. Customers always thank me for installing it anyway. Microsoft blew off one foot with Vista. With Windows8 they are steadily working their way from blowing both feet off right up the torso with their shotgun of stupidity and arrogance. Never has there been a better time to move people off of Windows to Linux. Its no wonder Microsoft pushed for control of UEFI. What better way to keep them on the farm than by locking all exit roads? I’m a Linux user, who has installed Start8 on 3 different machines, because (guess what, Microsoft?) 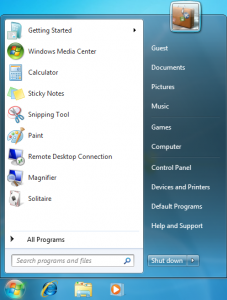 people don’t just want a Start BUTTON, they want a Start MENU, which Start8 provides. If only I could persuade the average Windows-hater to upgrade to GNU/Linux, I could die a happy man. Making Windows free would only accelerate Redmond’s decline. One of the stigmas to Linux is that it’s free, so many of the public assume that it can’t be that good. By charging for Windows, too many people believe that it has to be better, since they are paying good money for it. To put Windows and Linux on an equal cost footing would only make it too easy for the general public to see just how poorly Windows compares. Even if Windows 8 was perfect in every way *Mary Poppins* due to not featuring a start button that makes it a total fail. An OS should not force users to hunt for an *app* to make a start button appear. That is a crime which is called Blackmail and Windows users whether they know it or not are being blackmailed into the OS. If you try to run a computer or laptop with Windows XP the moment it goes online to connect Microsoft for updates it immediately crashes and no tech support from MS are available……hmmmmm. We lost 2 computers that way because of MS updates screwing up on older computers and now I’ve notice about once a week 7 screws up on updates which never used to last winter. Microsoft is trying VERY hard to force people into accepting Windows 8. Here is a blog I found that describes it in more detail about the tactics they are using to the uninformed masses. Here is a preview. Recently, I have been shopping for a new computer and have been looking for any computer that does not have Windows 8, as I am an American and I FREELY CHOOSE to NOT want that operating system on my computer. I am fully aware of all of the bugs in the new operating system, including the fact that Microsoft has a default setting in their system that allows the NSA to go in, view and copy any information on your computer to be used against you WITHOUT your explicit authorization and going against any or all privacy laws. Are you kidding me? This is an invasion of privacy, is unethical and goes against every law in the book! There shouldn’t even be anything to allow anyone into your computer unless you specifically say so! So knowing this, I refuse to get Windows 8 and decided to go shopping for a simple $400 laptop that has Windows 7 on it (knowing that Windows XP is phased out and Vista is a mess). As I went to Frys, Best Buy and even a local computer store, I have gotten plenty of information from salesmen who mostly give me a look that they know what is going on, while others pretend to not know and then say there are other reasons why they don’t allow anything but Windows 8 to be sold anymore in stores. Starting with Frys, I noticed they all have Windows 8 and asked the salesman why they don’t have Windows 7 on them and told them all about Microsoft allowing NSA a backdoor into the system. Now I know that Windows 7 also has its own backdoor as well, but Windows 8 has become so blatant about it that I refuse to purchase a computer with it. Anyways, one salesman stated that the company is required to have them and not any other operating system. I told them that I refused to buy a computer with Windows 8 on it and he said, “Yep, trust me. You’re not the only one”. Of course, for a fee they can reinstall it but stated that the drivers may not work with Windows 7 or XP, as some are not compatible. BLACKMAIL! I totally agree with that blog owner that it is false advertising on Fry’s end which is unusual for them because they have been very honest with us. My computer got destroyed by a Windows 7 update and since it’s store bought from Circuit City with Vista preinstalled the tech guy had to go thru hell to get it installed which at first Microsoft would REFUSE to acknowledge but somehow after Fry’s made a long phone call he said something that made Microsoft pony up and allow my computer to accept it. I am sure the tech guy chewed Microsoft out BIG TIME because he was at first refused the password and right about the same time strangely Microsoft extended support on Windows 7. They were originally going to stop supporting it by now.